Nick and I arrived to his parent’s house in Arnold, MO (right outside of STL) late Friday night. We had a quick dinner of beef and rice (protein and carbs!) before heading to bed. They say 2 nights out from a marathon is most important for sleep, and I wasn’t about to mess that up! I tried to sleep in as late as possible, but Mr. Mac had different plans for mommy. So we were up around 6 a.m. I had some Cheerios and coffee, and Mac headed back to bed around 7 a.m. I was wired after my coffee, so I decided to head to Jazzercise to visit the South County Jazzercise ladies while I was in town. 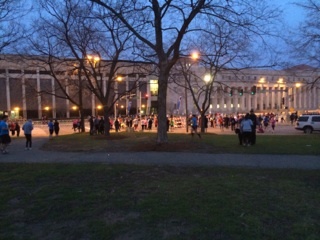 I didn’t have time for a 2 mile shake-out run, so I thought one Jazzercise class would do the trick instead! I arrived to a full room of welcoming ladies and enjoyed taking class from an awesome instructor named Lisa. She reminded me of myself a lot when I teach, so I got into a good flow right away! After class, I headed back home to wake up Nick and have some more carbs (Greek yogurt and a banana). We had a semi-busy day scheduled: the Go! 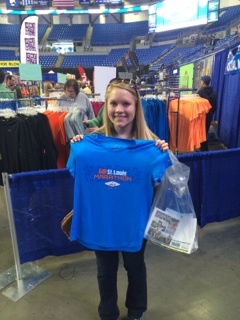 STL Marathon Expo and lunch with my friend Emily. We met Emily at Noodles & Co. for some last minute carbo-loading during her lunch break. I didn’t take any photos because we got so caught up in convo, but it was really good! I’ve never eaten at one before, and I must say it was amazing! I had a pesto pasta with parmesan-crusted chicken. It was SO tasty, and I ate every bite of my meal. And it was nice to catch up with my best friend too. 🙂 Nick was a good sport and listened to our girl-talk for the hour before she headed back to work and we headed over to the expo. 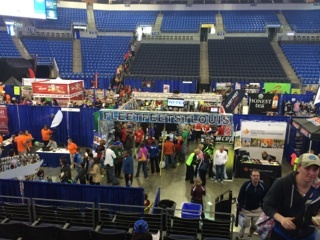 The expo was held in Chaifetz Arena on STL University’s campus. Fun fact: Nick’s high school graduation also took place here! 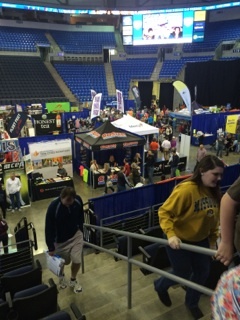 It was a huge venue that seemed a little unnecessary for the small number of vendors there. But, it was easy to get to and park, so it was ok by me. I picked up my bib, shirt, and goodie bag with no problems. The only thing that caught me off guard was how many more lines there were for the half marathon and marathon relays than the full marathon. I could tell I would be a part of the minority during the race. Nick and I wandered around and got some granola bar samples, coupons, and picked up some extra Body Glide. 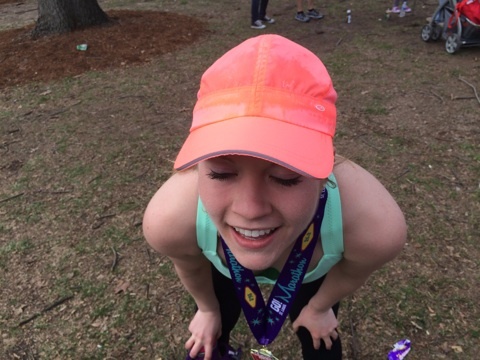 I chaffed around the bottom of my sports bra during my first marathon and thought Body Glide would be easier to apply to my back than the goopy Aquaphor that I use everywhere else. After 30 minutes, we decided to head home and relax with Mac and Nick’s family for a few hours before dinner. Karen, Nick’s momma, is so sweet and always does a pasta dinner for me on the nights before any of my races. We had spaghetti with turkey meat sauce, garlic bread, and salad. Yum! This dinner mixed with my snacking all day left me feeling extra full. So I decided no more eating after 7 pm to give myself a full 12 hours to digest before race time. I switched over to drinking Gatorade for the rest of the night before heading to bed around 8:30 pm. My 4:30 am wake-up call was going to come way too fast! I actually woke up before my 4:30 alarm. At 4:18 am on the dot, I was wide awake and popped out of bed to start my pre-race ritual. Coffee + 2 slices of toast with jelly. Followed by lots of Gatorade. 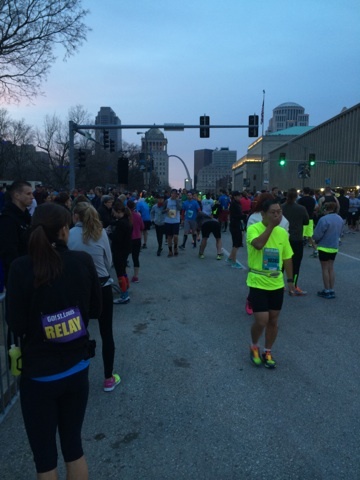 I was leery about the coffee since I knew it was the culprit behind my porta-potty stop during my first marathon, but I knew I had 2 hours to use the bathroom before I had to line up. 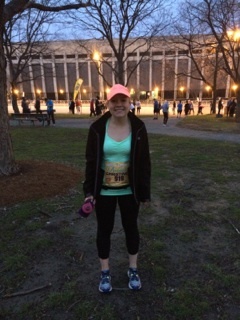 I woke Nick up at 5 am, got my race outfit on, double-checked that I had my race essentials (hat, gels, water), and we headed out a few minutes before 5:30 am. 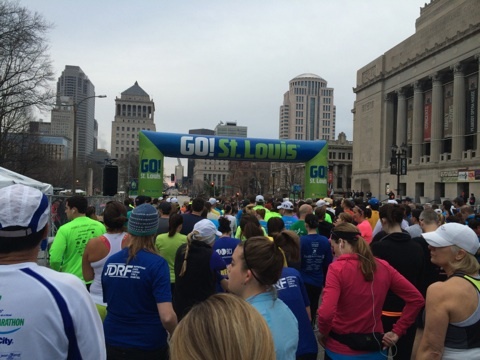 Traffic was light, and we found space in the first parking garage that we came to (right by the Scottrade Center). Hooray! Race day parking always stresses me out. 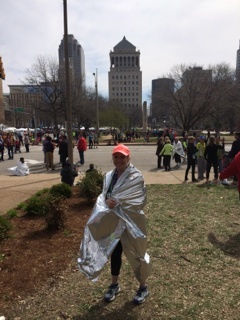 It was fairly quiet around the race corrals, and Nick and I wandered around to stay warm. It was crazy that it was still dark outside! 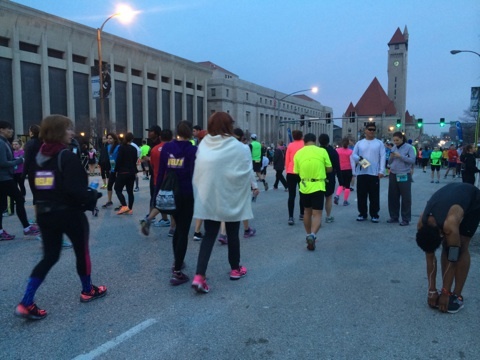 A 7 a.m. race means that your whole morning will be in the dark basically until you take off! So I was pretty entertaining to watch the sleepy runners emerge from the parking garages and hotels. It was like a mob of sleepy zombies was slowly coming together on Market Street. HA! We stayed in a grassy area near the porta-potty village. I used the restroom 2x before getting in my corral. The man announcing over the loud speaker kept saying that the ‘Corrals would be closing promptly at 6:40 am’. 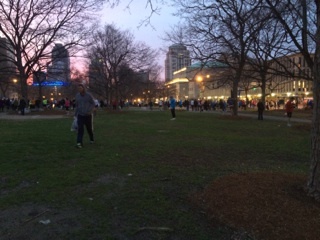 So I got myself into my corral by 6:38….only to find that people kept coming in up until the last minute! My corral started at 7:06 a.m. on the dot. I was towards the front of the corral, so I took off pretty quickly and settled into a good pace. From the very beginning everyone around me seemed to be in high spirits. The sun was shining, and the temps were perfect. On the first hill we hit (close to Anheuser-Busch brewery), people around me were even joking about the hill: “Who put this hill here? 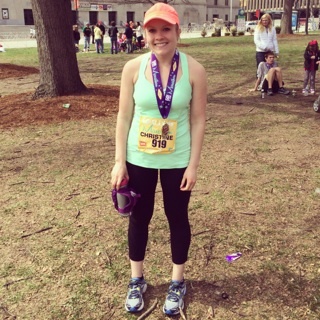 !” The first 6 miles went by REALLY fast. Like really, really fast. Before I knew it, I was already 1 hour and 7.3 miles in. I was running a great, quick pace. I knew I was running on the fast side, but I was feeling good. At the half, I had a pace of 8:45/mile at 1:54.32. 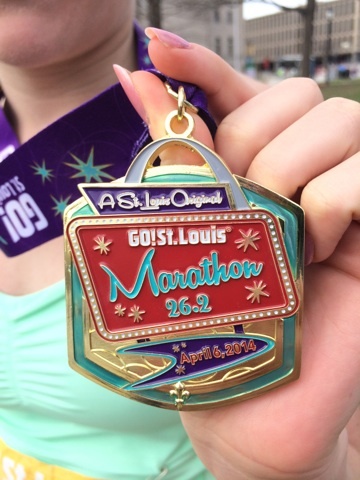 Woah – that was faster than when I ran my first half marathon. Ok, need to slow down! After mile 13, I knew the hills on this course would be the death of me. It felt like I would never make it to the 3 hour mark. Hour 2 went on and on for what felt like days. At Mile 19, I finally started to re-engage my mind (something I try not to do during long runs! ), and I realized I was going to have to take a walk break. My feet were on fire! Seriously….It was bad. The balls of both feet felt like they each were one giant blister. Ouch. I pushed as long as I could. I didn’t want to walk before mile 23, which is when I took my first walk break during the Little Rock Marathon. But my mind took over, and I took a 30 second walk break at mile 19. And then again at mile 20. And then at a couple water stations I would walk and finish off a cup of Gatorade before pushing to a run again. My pace stayed pretty fast considering the breaks I took. My phone read off that I had a 8:48 pace after the first walk break, and by the end, I had slowed only to a 9:16/mile time. 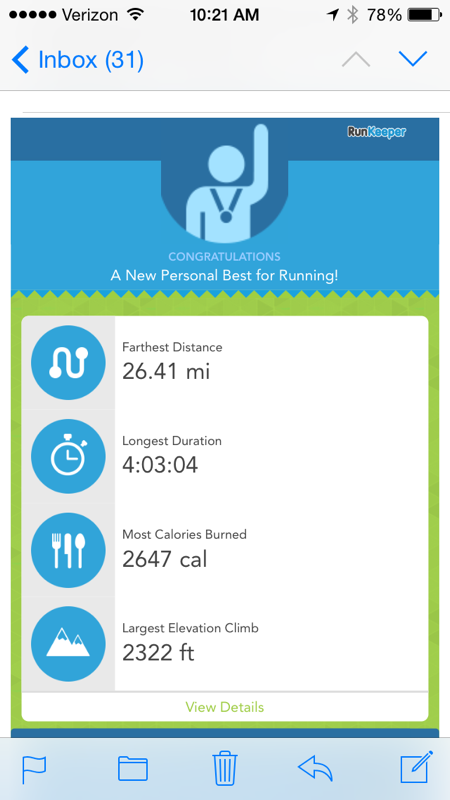 Not too shabby for someone who’s feet were burning through the last 10K of 26 miles! The final .7ish miles to the finish line were uphill. Ugh. I could hear the cheers from the spectators, and others around me were starting to sprint to the finish. I wanted to walk again SO BAD but I knew the faster I moved, the faster I would be done. Plus, I didn’t want to cross the finish line walking after I ran 97% of this dang thing! So I pushed myself up that last incline with my last bit of strength. 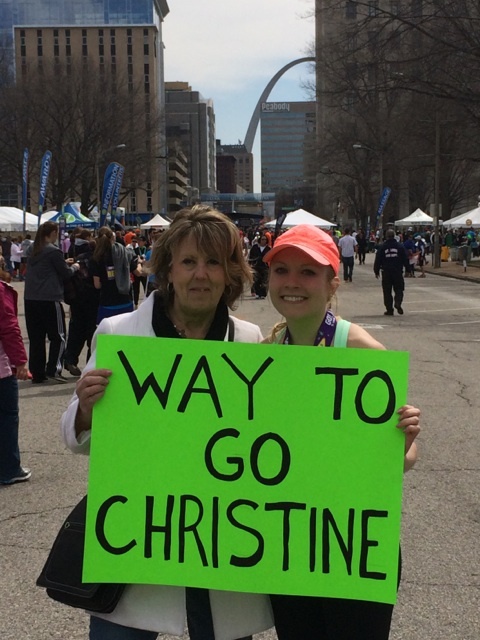 Right before I crossed, I saw Nick and his parents holding my giant lime green sign and cheering me on. 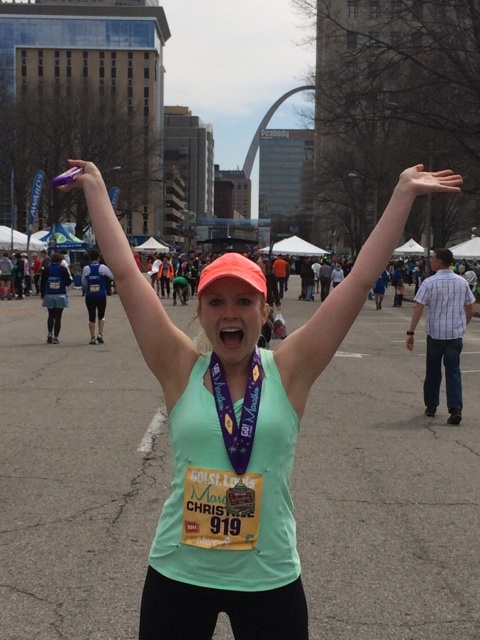 Over the loud speaker, the announcer read off my name, and I immediately threw my hands up as I crossed the finish line. I had done it! My official time was 4:03:02. A full 11 minutes shorter than the Little Rock race! WOO!! I was shocked by this new PR! They immediately put my medal around my neck, and I was ushered over to the official race photo area. The photographer asked if I was ready, and I said, “No, I would really like to pass out now…” HA! He luckily knew I was joking. I got some sweaty pics taken before moving on to get a mylar blanket (temps were in the low 50’s and I was cooling off) and some food. Most of the goodies were not lactose-intolerant friendly, so I opted for a PB & J graham cracker sandwich and some toasted raviolis (meat-filled). I left the finishers area and found Nick and his family waiting with open arms. I got lots of sweaty hugs and pictures with them before we walked around a bit to the different vendor tents to help stretch out my legs. Everything on my body hurt, so I was afraid to sit down in the car just yet. We walked for about 30 minutes by the time we made it back to the car, and I was starting to really feel the exhaustion set in. Nick got me in the car, and we headed to the nearest Denny’s. This girl was craving some serious breakfast food. I had packed a post-race bag with clean clothes, face wipes, flip flops, and deodorant. 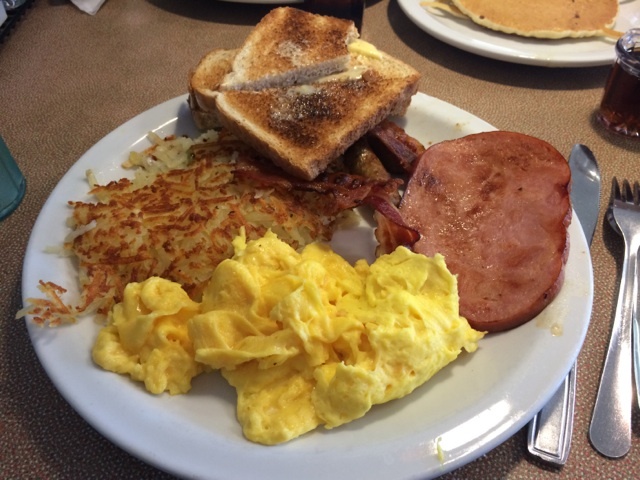 I headed to the Denny’s restroom to clean up the best I could before digging into one of the biggest plates of breakfast food I could find on the menu. We returned home to happy puppies. Mac loved mommy being covered in salty-goodness! Nick and I both showered, had another snack, and loaded up the car to head back to Springfield. We were hoping to make it home to Springfield around 7 p.m. BUT as we were leaving, we discovered a large metal hook in one of my tires! Great…..So luckily Walmart had a tire in stock and changed it in less than an hour. So we got on the road by 5 and made it back by 8 pm. 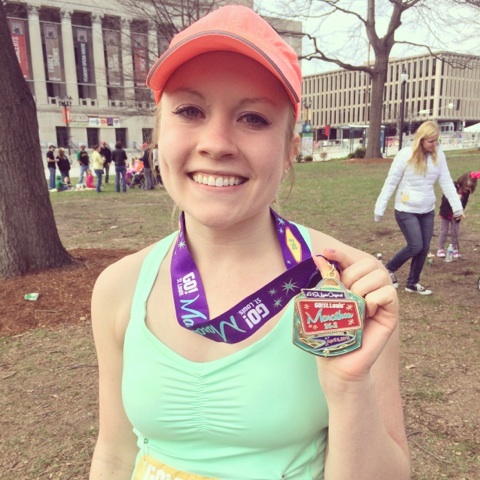 Just in this time for this two-time marathoner to hit the sack. I was exhausted. Whew! What a long and fun weekend it was! Overall, I really enjoyed the Go! 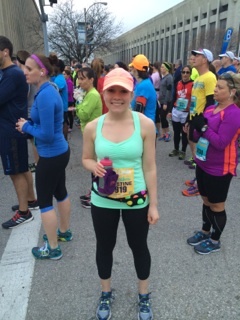 STL Marathon. It had great support, and it was well organized. It had some extreme elevation climbs with rolling hills that went on for miles and miles (hence the reason I’m limping around today!). 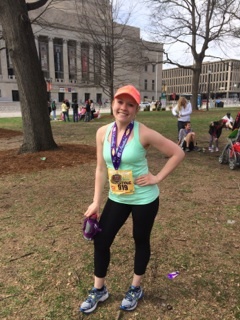 But the crowd support was amazing – I’ve never heard so many strangers cheer me on by name before! Having names on our race bibs is such a good idea! I was disappointed that I had to take some walk breaks at the end, but I’m still very happy with my time. 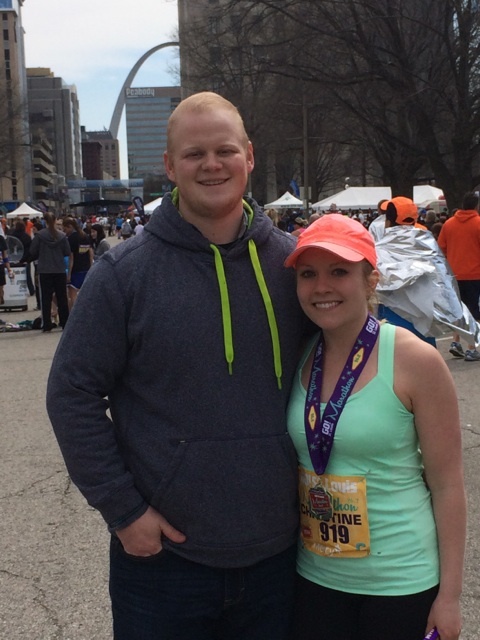 My mind and endurance levels were still ready to race through the last 10K. It was my feet that couldn’t take it. I think I just need to invest in some really awesome, thick padded socks to keep my feet as comfy as possible. All things aside, I still have a new PR by 11 MINUTES! And that is nothing to be upset about! Have a great night everyone!! !